Check out the exciting easter entertainment! 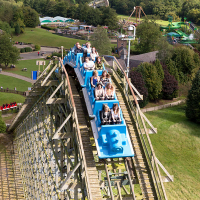 There’s something for everyone at lightwater valley! Thrill seekers will love the sky high thrill rides! Soar through the air on the Eagles Claw, hurtle through the deep, dark forest aboard The Ultimate (Europe’s longest roller coaster) and venture into the underground world of Raptor Attack then come see the park from a whole different viewpoint aboard the Black Pearl or hop on Apollo and take a spinning ride far above the tree tops. There are plenty of rides for the junior thrill seekers too, including Splash Falls with sharp turns and sudden drops, wet’n’wild fun on the Wild River Rapids, and swashbuckling adventures aboard our speedy Skull Rock and the tummy-tickling Flying Cutlass. Plus jump around on our huge Jumpin’ Jacks! bouncy pillow. Younger guests will love the outdoor and indoor play, the Lightwater Express train ride around the park, Eagles Creek Farm tractor ride, plus a selection of young fun fairground rides, the Adventure Playground and Mini Sand Diggers. Don’t forget to visit our indoor Soft Play & Cafe perfect for under 8’s to run off some energy whilst Mum and Dad have a seat with a relaxing coffee! New for 2019! - Smaller children can run free in our indoor play area - Jester's Jungle Fun and Toddler Play. Visit Riggmoor Petting Farm (available on weekends and school holidays) and watch our Space-themed Magic Lights UV puppet show in our brand new Show Barn.